A tale of two kingdoms, mirroring the reflective insight of animals and closing eyes of human kind. Animal Envy is a clarion call!" "It's good to see Ralph Nader turning his attention to the way we treat animals. Whether you love or hate the unusual framework he has chosen, the ideas he presents are important and demand our attention." 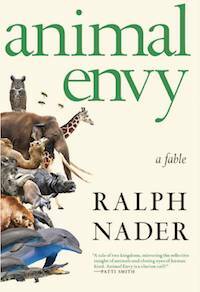 "Ralph Nader's Animal Envy is a stimulating, wide-ranging, and forward-looking book. By using a digitally converted language that is understandable across species, diverse nonhuman animals—from insects to whales—are able to communicate with one another and also with human animals. In an ensuing global assembly called 'The Great Talkout,' a panoply of animals not only tells us who they really are and what they want and need to flourish, but also shows how they can be of great benefit to us—a win-win for all. Along the way we meet many fascinating beings, including the insect triad—the Earthworm, the Monarch Butterfly, and the Honey Bee—who plea for the end of pesticides. Using results from research on the cognitive and emotional lives of animals, Mr. Nader weaves in plausible stories of what we can learn about their agenda if we take the time to talk with and listen carefully to them. All in all, Animal Envy is a highly original and visionary book that made me think deeply about human-animal relationships and how they must change as other animals plea for less violence and appeal for compassionate coexistence in the Anthropocene, an epoch that truly has become the rage of humanity." "Ralph Nader brings all of his formidable integrity and intelligence to this most important discussion of all: relations between humans and the rest of the world. We humans owe Nader a deep thank you for creating this crucial and far-reaching book." Named by the Atlantic as one of the hundred most influential figures in American history, and by Time and Life magazines as one of the hundred most influential Americans of the twentieth century, Ralph Nader and the dozens of citizen groups he has founded have helped us drive safer cars, eat healthier food, breathe better air, drink cleaner water, and work in safer workplaces. Nader continues to be a relentless advocate for grassroots activism and democratic change. With Animal Envy, he is raising the stakes yet again with a book that could restore America to itself once and for all.